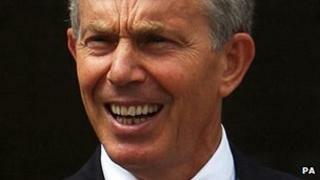 Former Prime Minister Tony Blair is to appear before the Leveson Inquiry into media standards on Monday. Culture Secretary Jeremy Hunt will give evidence on Thursday, the inquiry witness list shows. He will be asked about his office's links with News Corp during its bid to take over satellite broadcaster BSkyB. Prime Minister David Cameron told ITV's This Morning he did not "regret" asking Mr Hunt to rule on the abortive deal and said he had acted "impartially". Mr Blair will be questioned over whether his relationship with News Corp owner Rupert Murdoch and the company's News International subsidiary was too close. One of his former ministers Lord Mandelson told the inquiry on Monday the relationship had "arguably" become "closer than wise" but dismissed claims of a "Faustian pact" involving commercial concessions for News Corp in return for support from its newspapers. Mr Blair travelled to Hayman Island in Australia to address News Corp executives in 1995, as part of a Labour strategy to communicate with newspapers that had unfavourably portrayed previous leaders Michael Foot and Neil Kinnock. He is also godfather to one of the media tycoon's children. The former PM is no stranger to appearing before public inquiries. He previously gave evidence to the Hutton inquiry into the death of government scientist Dr David Kelly - the source for the controversial BBC report about intelligence in last September's dossier being exaggerated to make the case for war. He told the inquiry in 2003 he would have resigned if the claims about "sexing up" the Iraq dossier were true. In 2010, he said he had "no regrets" about removing Saddam Hussein from power during the Iraq inquiry, which was set up to investigate the run-up to the 2003 invasion of Iraq and its aftermath. The Leveson Inquiry is currently examining the relationship between the press and politicians. The other witnesses next week will include Business Secretary Vince Cable and Justice Secretary Ken Clarke, who will give evidence on Wednesday. Education Secretary Michael Gove and Home Secretary Theresa May will appear on Tuesday. Mr Cable, who was stripped of his responsibilities to oversee the BSkyB bid in December 2010 following comments made to reporters, is likely to asked about whether he dealt with the takeover attempt with a pre-conceived hostility. Mr Gove, a former Times journalist, a newspaper owned by News Corp, is expected to be asked about the frequency of his contacts with senior News Corp executives, as 11 meetings were recorded between the May 2010 general election and July 2011. He has previously described Rupert Murdoch as "a great man" and "a force of nature". Mrs May is expected to face questioning about police handling of phone-hacking allegations and the relationship between the police and the media. On Thursday, it was revealed that Mr Hunt had sent a memo to the prime minister indicating support for News Corp's bid weeks before he was asked to rule on the bid. Mr Hunt will face questions about whether his public expressions of support for the bid before he was given the role were compatible with his job in overseeing it. Speaking to This Morning, Mr Cameron said: "I don't regret giving the job to Jeremy Hunt, it was the right thing to do in the circumstances, which were not of my making." The PM added: "The crucial point, the really crucial point, is did Jeremy Hunt carry out his role properly with respect to BSkyB and I believe that he did." Mr Cameron has previously made it known that immediate action will be taken if it emerges that the ministerial code has been breached. The prime minister said he was "looking forward to giving evidence" so "all of this will be out in the open". He went on to say there was no "great conspiracy" between him and Rupert Murdoch in return for support for his government but the relationship between politicians and the press on had got "too close." "There are lessons to learn, we are already learning those with far more transparency about contacts between press and politicians. "No government has done that before, but I'm pleased my government is doing it." Mr Cameron's comments came as Mr Hunt's former special adviser Adam Smith began his second day of questioning at the Leveson Inquiry. Mr Hunt had asked for his appearance at the inquiry to be brought forward so he could give his side of the story as soon as possible, but his request was denied. Mr Hunt says that he supervised the process "with scrupulous fairness throughout."